That is what just about sums up the past week: rain, rain, and more rain. Not whole days long, fortunately, but spread out over the week and then a massive downpour on Friday night. It was all over our local news. Nelspruit had a big storm late Friday afternoon. There were images of cars driving through rivers of water down the R40 at Riverside Mall. People even reported seeing a tornado! Well, we got the tail end of that storm and a nice 30 mm in the space of 30 minutes! All this rain of the past week has made my vegetables very happy! My peppers are growing nicely and I can harvest a good handful of peppers once a week! Not only are my veggies happy, but so is the bush. I kind of feel like we are getting rain very late in the season, but according to Steven, it is quite normal for this part of Kruger. And if the bush is happy, I am happy! The frogs have been singing their happy song since last week and so have the crickets. All the other animals we usually see around the house also look pleased with all the rain. I see impalas jumping for joy early in the morning. Or maybe they just don’t like the dew on the grass touching their bellies? The elephants have not been around much at all lately. I see a glimpse of them every now and then across the river at Leopard Creek’s side, but I have not seen them at the front of the house for a while now. As much as their attempted break-ins during the Marula season were a bit hectic, I miss having them walk past the front gate. I guess the phrase “you don’t miss it till it’s gone” is applicable here! There is just so much water and food in the veld, the animals do not have to come to the river and past our house to get a drink. The only animals that have continued their nightly patrol around our little compound are the hyenas. Oh and the monkeys of course! ;-) Both of which seem to have accepted my Trailcam as part of their natural surroundings now. I am pleased to report that my Trailcam has suffered no further ‘attacks’ from monkeys nor hyenas! If you like the Trailcam footage there is a lovely FB group called Trailcamming In Southern Africa you might want to check out. PS. Jack is back to his old self! Thanks for all your well wishes! Dear Elephants of Malelane Section… we need to talk! Its great to hear that Jack is back to normal, and also to hear about all the rain Kruger has been receiving. Maybe some of the water will still be around when we get there! 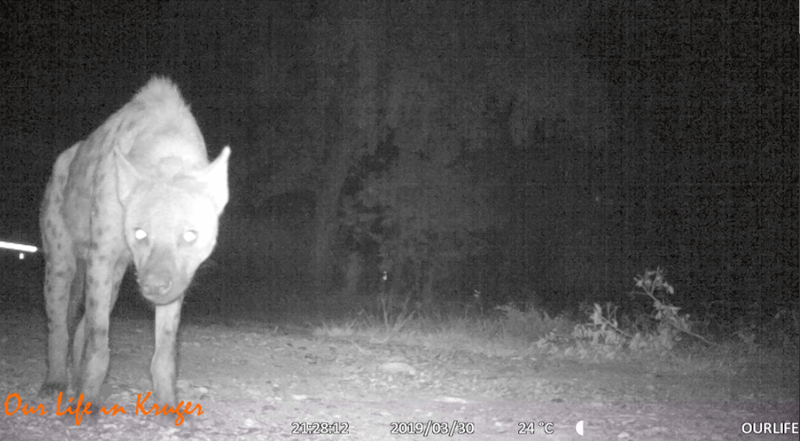 Your trail- cam footage is, as always, so delightful. It really doesn’t matter whether its large or small, morning or night, moving or still – its all a part of feeling there in the moment for a little while. Many thanks, as always, for sharing! So happy to hear that you’ve had so much rain. What a difference from 6 months ago when all was dry and barren, no grass in lots of places. I will just have to come back soon to see the opposite extreme. Thank you for your lovely stories. I love reading them. And the trail cam videos. Glad your little Jack is better.